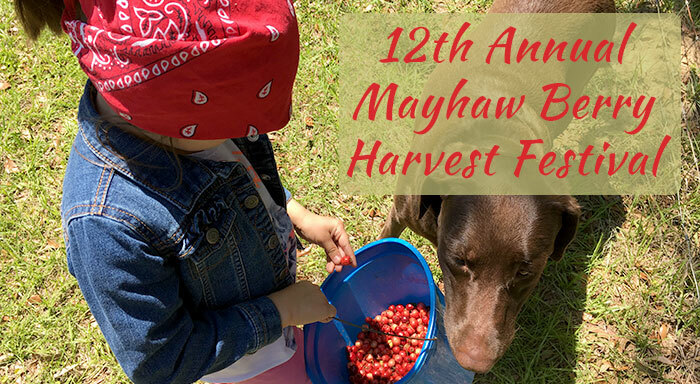 Come and experience North Florida at its finest at the 12th Annual Mayhaw Berry Harvest Festival. Enjoy our 50-acre, working goat and sheep ranch with the largest, native Mayhaw Berry Stand in Jefferson County. It’s a fabulous, real-farm experience for the whole family! Start with Fiber Friday and the Bonfire Kickoff Party. Then join us on Saturday or Sunday to watch the harvest and buy fresh berries. Go on a free, hayride farm tour, feed and pet the animals, buy Mayhaw jelly in our Country Store and picnic with beautiful pasture views. Keep coming back to this page for updates. There’s always something new now that we’re getting ready. Or sign up for our newsletter where we announce events and livestock for sale.